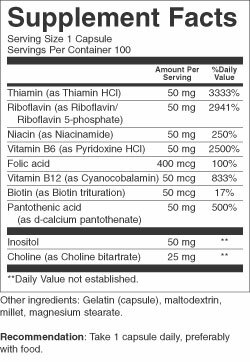 B-50 Complex (100 膠囊)- Save-On Nutrition Centre Ltd. This complex provides 50 mg of 10 important vitamin B supplements. Most doses meet the US RDA. B vitamins are precursors of coenzymes involved in the conversion of cellular energy, manufacture of hormones and proteins, and repair and maintenance of nerve structures.